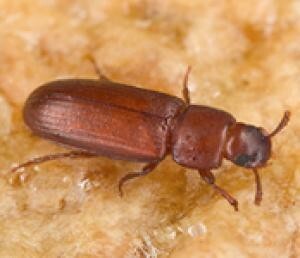 Beetles can be a difficult pest to detect and can be found in many situations and products such as tobacco, fabric, grain and flour. The adults are fairly long lived and both adults and larvae need to feed, so both are responsible for damage. The adults requirement to feed means they are less responsive to chemical attractants and makes them more difficult to lure into traps than moths. Agrisense Beetle Traps make detection and treatment easy as they allow early detection and identification of the problem, help locate the source, and provide population information. All of which enables the industry technicians to make better decisions about how best to deal with an infestation. Because beetle pests are so varied and their habits are so different, a good understanding of their biology is essential in knowing how best to catch them. Appropriate use of different attractants and different traps based on this knowledge will provide more effective monitoring. Lasioderma serricorne is a primary pest of stored leaf tobacco, cigars and cigarettes; However, this insect will infest a good many other stored food products such as cereals spices and cocoa beans. Widely distributed in the tropics, although infestations in the temperate zones are susceptible to cold conditions, this pest has a complete metamorphosis life cycle. Females lay eggs over a three week period which will hatch in generally between one to two weeks. These eggs hatch into a larval stage which lasts for about five to ten weeks in which they go through several instars until pupating for a further two to three weeks. They then finally emerge as adults which live for up to about one month. They can have between three to six generations per annum in warmer climates or as little as one in colder zones. This pest causes a large degree of economic loss, particularly (although not exclusively) to the tobacco industry. It is one of the few species of insects that does not find nicotine repellent. Larvae and adults will also chew through many types of packaging in order to find a place to pupate or lay eggs. 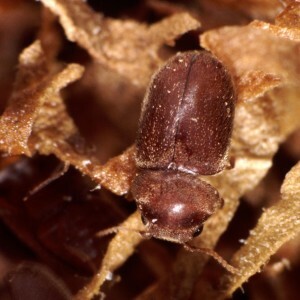 Flour Beetle – Tribolium spp. A highly significant, widely distributed and successful primary pest predominantly found in the milling industry. Although it will infest stored grain, it tends to be as a secondary pest there that prefers to colonise materials already attacked by primary grain pests. Economic loss due to this insect alone is high, due to it’s tendency to taint food substrates with secretions. Populations are established in ships holds, storage silos, flour mills, bakeries and pantries around the globe. Microhabitats in large industrial situations include machines and process equipment where build up of old food substrates allow completion of life cycle. The high breeding potential of this species can lead to very large infestations in suitable conditions. Two of the main species found are Tribolium confusum (confused flour beetle) and Tribolium castaneum (Red flour beetle). These two beetles have a very similar life cycle. Females can lay up to 500 eggs over a period of a few months in their lives, which can be well over one year depending upon conditions. Life cycle may be completed in seven to twelve weeks but in warmer conditions such as those in bakeries, this may be reduced to five weeks. This high breeding potential can lead to very large infestations in suitable conditions. Carpet Beetle – Attagenus spp. While being sub-tropical in origin, this pest is widely found in Europe and is often found in and around foodstuffs. 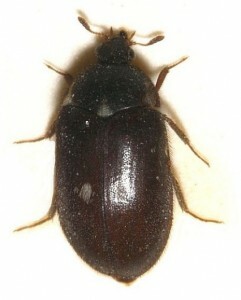 The species may also be seen wandering on walls and windows as well as on carpets. Bird’s nests, animal remains and dead insects are focal points for populations that are able to thrive on the source of protein. Mating occurs immediately subsequent to emergence. Larval forms cause significant damage to keratin containing products such as wool, fur, leather, silk and dried animal remains. Although this pest creates no webbing, its activities are indicated by the presence of clean, irregular holes in textiles in the vicinity. Quantities of larval skins or exuvia will also indicate the presence of this pest.